First of May. Have you registered yet? Visit www.bum2008-desiderata.blogspot.com and spread the word. 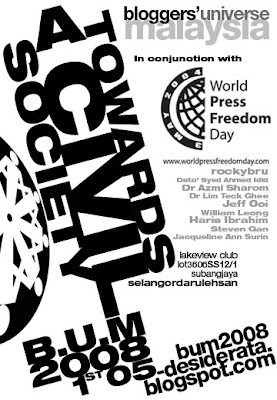 Speakers include a controversial former judge, a rocker-intellect, the world's first blogger-MP, a blogger-activist, a Citizen journalist, journo-bloggers, blogger-bloggers. The same sponsors who gave us lamb last year are giving us more lamb this year. Who says RM50 can't get you much these days? Great cyberposter by, who else? Its no secret that Karpal is favorable for our weak PM. He has been attacking Tun Dr. M with such venom while defending Pak Lah. There must be some chemistry between Karpal and Badawi. The question is why? Aren't they supposed to be on warring sides? I guess PM has given Karpal soo much more than he ever expected in his political career. Pak Lah has given DAP such power and influence they never thought was actually possible. Pak Lah has destroyed UMNO in ways never fantasized by the opposition. Most of all, Pak Lah is the 'Man' to derail all of Mahathir's plans to thrust Malaysia forward into Vision 2020 and modernity. This present administration can turn its back on all that UMNO fights for and hand over the reins of power to the opposition. Pak Lah and his henchmen run down Malaysia's Father of Modernisation like no other opposition politican can. Its definitely a match made in heaven. Thas why Karpal loves Pak Lah. if only you guys have it on the 3rd instead.